Bad credit and a plan to buy a new car may seem like a unlikely combo, but with some creative steps, anyone can pull this off. And it doesn’t start by browsing the latest makes and models that are available in the market right now. If you are facing the same predicament, and you still want to pursue a new car, make sure you consider the following tips. Know where you stand, credit-wise. If you think that you have a bad credit and you are looking to buy a new car, then it’s best to know where you stand. Experts recommend getting a copy of your credit score a month before you browse car shopping websites. By knowing your credit score and the details, you can protect yourself from unfair loan arrangements that can be offered by dishonest loan brokers. Knowing your credit score or getting a formal copy will not cost you money, provided you know where to turn to. If you maintain a credit card, the first resource that you should check with is the credit card provider. Based on the figures provided by the Consumer Financial Protection Bureau, nearly 50 million individuals are now getting their credit scores from their credit card. The federal government has required credit card providers to offer this service for free. Some of the leading credit card companies started issuing credit scores to clients free of charge starting 2014. Barclays and Discover are just two of the leading companies that offer free credit scores for its clients.Bank of America and Chase are expected to offer this service as well to help its clients understand their credit standing. For some banks, the offer is available for a limited time only, so it’s best to ask your card issuer if they offer a similar service. If this step is not possible, the traditional sources of credit scores like Experian, TransUnion and Equifax can serve as your friend. By law, these institutions are mandated to give consumers with a copy of their credit scores annually. And if you notice some errors on the report, it’s best to immediately report these errors and oversights. You can also find a website that allows you to correct some of the errors. Rebuild your score before choosing a make and model. A bad or ‘questionable credit score’ is bad news for someone looking to get a new car on a loan. If your search yielded a bad credit score and reputation, it is advised to rebuild first the score before checking out your preferred make and model. Allowing 12 to 24 months to pass before buying a new car is more than enough time to rebuild a badly hit score. This can be done by making on-time payments of all utility bills, and making sure that credit card balances are eliminated. If a brand new car cannot wait, then consider choosing a lower priced new car, or a barely used pre-owned vehicle instead of splurging on a premium make and model. You can save thousands buying a car only 1-3 years old. When it comes to choosing the best loan terms, it’s best to go for a short term loan arrangement, from 2 to 3 years. Choose this type of loan, provided you can accommodate a higher monthly payment. The shorter the term of your car loan, the more money you can save on the interest. Your best option is to ask for a 2-year term auto loan, but many people sign up for a 36-month loan term which costs a lot more over time in interest. You can easily find cheap trucks and cars in many website listings and used car comparison websites. After being approved, make sure to make on-time payments and for other credit based items you have like a mortgage or credit cards to keep your score on the rise.Remember, bad credit does not stay forever. By doing some prompt payments, you’ll end up with a better credit score, and should allow you to buy a new and expensive vehicle, or refinance your past loan. Consider non-profit lenders. Aside from banks and other traditional lending institutions, you can also count on the services of non-profit lenders. These companies often offer personal loans that start from $8,000 to $15,000, which is good enough to cover a decent entry level family sedan, or a flashy used car. Some of these loan arrangements come with certain restrictions, like completing the purchase in a certain region, or working with selected websites. These lending agencies are certified by the US Treasury Department, aimed at helping average consumers. To check if there’s a lender near your area, check the Opportunity Finance Network. Stay away from ‘bad and scrupulous lenders’.The only way to avoid getting duped by these lenders is to work with mainstream banks and lenders. If you work with these lenders, you should be able to make on-time payments, and never miss out on your schedule. Miss one or two months, and your car is immediately re-possessed. Also, some of these lenders will tell you that you need to buy extra features, like clear coating and extended warranties for you to be considered for a loan. This is not a requirement, and when you sign up, you’ll end up a loser. Keep a price range in mind, consider total costs and stick with it. So you’re credit score has stabilized after 24 months, and you are ready to hit the dealerships. Before you visit the dealerships (or check the car comparison websites), identify first your price range and consider the total costs. When it comes to buying a new car, some individuals tend to focus solely on the monthly amortization. Even if you have been qualified for a $20,000 entry-level sedan, it doesn’t automatically mean that it’s right for you. If you can scale back your choice a bit, you can free up $100 or $200 off the amortization, which you can use for gas and insurance. Remember, when your credit score is still recovering, you may want to forget first the premium options, like leather seats. Don’t forget to bring your documents to support new-found standing. When you talk to a dealer, you should be ready with your documents to back up your application. Some of the critical documents that you should bring are copies of recent pay stubs or pay slips, utility bills, your driver license and a list of references. 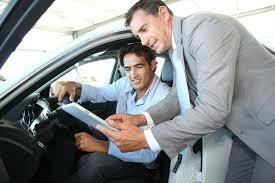 The dealership will need to establish that you are credit-worthy, and you need to show off your new credit standing. Making sure that all payments are made before the cut-off requires sacrifices, but if you manage to improve your score, it can be both satisfying and liberating. Getting an improved credit score will not just help you get a new car but it can train you to adopt a responsible financial habits that can help you for a long time.